In August 1897, the Baltimore Orioles called up left-hander Morris “Doc” Amole to fortify the club’s pitching staff for a late-season National League pennant run. In spot starter/relief duty, Amole pitched creditably, posting a 4-4 record, with a 2.57 ERA in 11 games. He was traded to Washington in the offseason and big things were expected of the young hurler, but he failed miserably. After going 0-6 in seven games, Amole was unconditionally released. He spent most of the remainder of his career pitching in high minor leagues with mixed results, highlighted by the April 1900 no-hitter that he pitched in the very first game played in the new American (nee Western) League. Despite that gem, Amole never received another major-league chance. Doc was only several years removed from a final pitching comeback try when he was found dead in his room at a Wilmington, Delaware, boarding house on March 9, 1912. He was only 38. For the next three years, Amole played for a Coatesville nine in the Chester County League. On occasion he also pitched for the Coatesville YMCA team.11 In November 1895 Doc took on domestic responsibilities, marrying a 22-year-old widow named Mary Ellis. 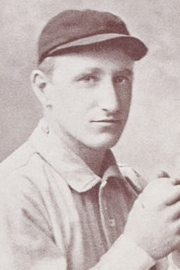 He entered professional baseball ranks the following February, signing with the Wilmington Peaches of the Atlantic League12 and taking up local residence.13 The highlight – perhaps apocryphal – of the 1896 Wilmington season occurred during the night half of a Fourth of July doubleheader against Paterson. In the fourth inning, Amole reportedly slipped a firecracker into the ball and then pitched it to an unsuspecting Sam McMackin, the Paterson pitcher. The firecracker exploded upon contact with McMackin’s bat, startling spectators with a loud bang and leaving the bat shattered in McMackin’s hands. The prank, alas, was not appreciated, prompting the umpire to call an immediate end to the game.14 Such an abbreviated pitching performance was a rarity for Amole that season. He finished 43 of his 47 starts. At 5-feet-9 and 170 pounds, Doc was sturdily built but ill-prepared for the punishing workload that Peaches manager Denny Long would subject him to. In 417 innings pitched, Doc went 22-24, with a fine 2.54 ERA for a seventh-place (58-79) Wilmington club. That maiden pro season, however, took its toll on his pitching arm. Thereafter, Amole, originally a hard thrower, relied mainly on slow stuff, a deceptive side-arm delivery, and an exceptional pickoff move to first. At the close of the 1896 campaign, Baltimore manager Ned Hanlon drafted Amole, paying Wilmington $500 for his contract rights.15 With competition from young guns like Joe Corbett, Bill Hoffer, Arlie Pond, and fellow Wilmington graduate Jerry Nops, Amole found himself the odd man out in the Orioles’ 1897 pitching plans. Hanlon therefore optioned him to the Reading Coal Heavers of the Atlantic League, reuniting Amole with new Reading manager Denny Long. Again, Long subjected Amole to overuse, once having him pitch (and win) both ends of a June doubleheader. By early August, Amole had already racked up 277 innings pitched, going 12-12, with a sparkling 1.75 ERA for a dreadful Coal Heavers club headed for a last place (40-100) finish. Meanwhile back in Baltimore, Hanlon’s Orioles were locked in a tight battle with Boston Beaneaters for the National League pennant and in need of additional pitching. On August 19, 1897, 23-year-old call-up Doc Amole made his major-league debut, starting for Baltimore against the Cleveland Spiders and Cy Young. Amole lost 3-0 but turned in an able complete-game performance, spacing six hits and striking out three, only to be undone by Orioles fielding. All three Spiders’ runs were unearned. Eight days later, Doc notched his first win, a route-going 5-3 victory over Cincinnati. In all, Amole appeared in 11 games for Baltimore, posting a 4-4 record with a 2.57 ERA in 70 innings pitched. He struck out 19, walked 17, and confined opposing batsmen to a .250 batting average. Baltimore (90-40) finished a close second to the pennant-winning (93-39) Beaneaters, with the two clubs then squaring off for the postseason Temple Cup match. Although Corbett, Hoffer, and Nops were hit with regularity by Boston batsmen, manager Hanlon declined to use a fourth arm in the series, relying upon future Hall of Famers Willie Keeler, Hugh Jennings, Joe Kelley, John McGraw, and Wilbert Robinson to inflict even greater damage on the enemy pitching corps. The strategy prevailed, as Baltimore captured the Cup in five high-scoring games, 4 to 1. Despite having been with the club for little more than one month and no more than a bench warmer during postseason play, Amole was awarded a full $310 Cup victors’ share,16 a seeming down payment on sterling performances expected of him in future. Awaiting the 1898 campaign, Amole returned to Coatesville, where he worked in the offseason as a carpenter. But his baseball future did not reside with the Baltimore Orioles. In December 1897, manager Hanlon included Amole in a six-player trade that shipped him to Washington – essentially in exchange for another Doc, curveballing right-hander James “Doc” McJames. Hanlon expressed reluctance in parting with Amole, whom he held in high regard, but felt the need to include him in the trade as a deal sweetener. As for the merits of the exchanged Docs, Hanlon’s sentiments were clear. “I don’t think there is the least doubt that Baltimore is getting an erratic twirler (McJames) for a first-class man (Amole). The two are not equal, by any means.”17 Hanlon was an astute club leader, headed for an eventual berth in the Hall of Fame. But he could not have been more wrong regarding McJames and Amole. Amole got off on the wrong foot with his new club, refusing to accept Washington’s contract terms until early April. Still, he was given the honor of being the Senators’ starting pitcher in the 1898 home opener. Facing his old mates from Baltimore, Amole pitched poorly and was further hampered by inept Washington defensive work behind him. Final score: Baltimore 9, Washington 0. In the succeeding weeks, the situation did not improve. After losing several more starts, Amole was removed from the rotation. He fared no better in relief. Called upon to protect an 8-4 ninth-inning Washington lead, he promptly surrendered six runs to Brooklyn in a game lost 10-9. Four days later, two ninth-inning runs yielded by Amole spelled the difference in a 6-4 loss to Philadelphia. Describing Doc’s work as “a dismal failure,” Sporting Life was soon reporting that Amole had been left behind to work out on his own as Washington departed for a Western road trip in late May.18 Ominously, Amole was cited as being “in poor condition,” often a euphemism for a drinking problem. Behind the scenes, Washington brass offered Amole to NL rivals like Chicago and New York, but found no takers. On June 4, with the Amole log standing at 0-6, with a bloated 7.84 ERA, the club gave him his unconditional release. Doc McJames, meanwhile, had emerged as the Baltimore ace, and was then nearing the midway point of a superb 27-15/2.36 ERA season. Amole’s next outing, four days later, was a different story. He was hit freely by the Indianapolis Hoosiers and absorbed a 7-1 setback. A pattern for the 1900 Amole season had been set, with sharp performances alternating with dismal ones. In his next appearance against Indianapolis, for example, Doc threw a three-hit shutout (albeit with 11 walks), while in June the same Detroit team that Amole had no-hit two months earlier pounded him 21-9. All the while, the sporting press cautioned about the need for Amole to refrain from indulging unmentioned weaknesses. According to one syndicated baseball column, Amole’s “usefulness ceases the minute he returns to old habits,”29 while another declared that “if Amole keeps himself in condition, he is a winner.”30 Whatever his condition, Amole turned in yeoman work for a noncontending (61-78, seventh-place) Buffalo team. He posted a 22-22 record31 for a team whose number-two starter (Dan Kerwin) won only 12 games. In 342 innings pitched, Amole surrendered 350 hits, striking out 100 batters but walking 115. Doc was hopeful that such work had earned him another big-league shot, and one press report had him headed to Brooklyn in 1901.32 But Amole remained on the Buffalo reserve list, and his chances for reacquiring major-league status – and that of his club, as well – were dashed when Buffalo was jettisoned as an American League franchise and relegated to the Eastern League, a Class A minor league, for the 1901 season. Amole’s standing revived the following season, and his pitching drew some favorable notice. The Pawtucket Times, for example, described him as “the best sidewheeler in the league.”37 Even the Worchester Daily Spy had kind words: “The twirling of Amole has been wonderful.”38 But in truth, increasing age, an abused left arm, and the effects of overindulgence had reduced Amole to a minor-league journeyman, effective only when consigned to a reduced role on the Buffalo staff. Still, Amole was useful in spots, going 14-12 for a suddenly outstanding (88-45) Bisons club that fell only percentage points from the Eastern League crown. In the offseason, Amole decided to tempt fate and took a job at a local hotel-saloon. Once they found out, dismayed Buffalo club owners promptly released him.39 By March, however, Amole was back in the Buffalo fold – but only after he had given up his post behind the bar.40 But he would not see the season through with the Bisons. In July Buffalo suspended Amole indefinitely, commanding that he take daily walks and otherwise work out until he “regain[ed] the form expected.”41 Weeks later, he was traded to an Eastern League rival, the Providence Grays, with whom he finished the season. For the year, Doc went 8-10 between the two clubs. On March 9, 1912, Doc Amole was found dead on the floor of his room at a Wilmington boarding house. The cause of death was officially determined to be “congestion of the lungs.”51 Although the deceased was properly identified as Morris F. Amole by Delaware authorities, press accounts of his passing replaced Doc’s first name with that of the Amole who had recently been in the news. Most newspapers published a variant of the following: “George Amole, better known as ‘Doc’ Amole, formerly pitcher for Baltimore, Buffalo and Providence … was found dead at his boarding house in Wilmington, Del., Saturday.”52 Some 40 years later, the first edition of the Turkin and Thompson baseball encyclopedia confused the matter further, giving Amole’s name as: Morris George (Doc) Amole, a name nowhere found in the historical record. Turkin and Thompson simultaneously published another novel Amole biographical datum: a July 5, 1878, date of birth. This date has an untraceable provenance and utterly no support in the historical record, and bears all the hallmarks of pure invention. Regrettably, the Morris George Amole/July 5, 1878, identifiers for Doc Amole were adopted – apparently uncritically – by both the print and electronic successors to Turkin and Thompson, including Macmillan, Total Baseball, Baseball-Reference, Baseball Almanac, and the SABR Encyclopedia. Relying upon these reputable reference works, much that has been written about Amole in recent years – that he was only 19 years old when he made his major-league debut; that he was the youngest player in the National League during the 1897 and 1898 seasons; that he was only 33 when he died – is incorrect. Meanwhile, the process of correcting the Amole vital stats is currently in progress, with the SABR Biographical Committee having already amended its entry on Amole. After Morris F. “Doc” Amole died, his body was returned to Coatesville and buried there in Fairview Cemetery. No memorial marks his final resting place. Given that a century has now elapsed since he passed on, the now ongoing correction of the inaccurate biographical data long presented by baseball references seems a fitting substitute to a headstone for Doc Amole. The writer is indebted to baseball historian Peter Morris and photo archivist Pamela C. Powell of the Chester County Historical Society for their assistance in researching the life of Doc Amole. 1 Hy Turkin and S.C. Thompson, The Official Encyclopedia of Baseball (New York: A.S. Barnes & Co., 1951). 2 For some pointed commentary on the reliability of biographical data published in Turkin and Thompson, see Peter Morris, Cracking Baseball’s Cold Cases: Filling in the Facts About 17 Mystery Major Leaguers (Jefferson, North Carolina: McFarland, 2013), 18. 3 The Amole name and date of birth were corrected by the SABR Biographical Committee just prior to publication of this biography. Baseball-Reference has also amended its entry on Amole. Hopefully, the Amole data offered by other baseball reference resources will be corrected over time, as well. The sources for this profile include newspaper archives accessed via GenealogyBank.com; US Census and local directory data accessed via Ancestry.com; the Doc Amole file maintained at the Giamatti Research Center, National Baseball Hall of Fame and Museum, Cooperstown, New York; and particularly, Amole-related archival material provided by the Chester County (Pennsylvania) Historical Society. Unless otherwise noted, Amole’s baseball stats have been taken from Baseball-Reference. 4 Morris F. Amole, about age 6 and living with family in Springfield, Chester County, Pennsylvania, first appears on the 1880 US Census. What the F. represents is unknown. The place of birth (Chester County) and date of birth (January 1, 1874) provided in the text above are inscribed on the November 7, 1895, Pennsylvania marriage license application of Morris F. Amole and Mary A. Ellis, discovered by Peter Morris and viewable online at familysearch.org/pal:MM9.3/TH-1951-21124-14964-3?cc. These data are particularly significant because they would have been provided to a local government official by Amole himself (and perhaps under oath). 5 Biographical data for Doc’s parents and brothers William (born 1871) and Winfield (1876) appear in the 1880 US Census and elsewhere, while younger siblings George, Walter, Edward, Lulu, and Anna are noted as survivors in the Maurice (Doc) Amole obituary published in the West Chester (Pennsylvania) Daily Local News, March 11, 1912. 6 An error-filled Amole obituary published in Sporting Life, March 16, 1912, offered the inane comment that Amole “was said to have been graduated from a medical college and was called ‘Doc’….” It is doubtful that Amole’s education extended past the eighth grade, if it got that far. The true basis for Doc Amole’s nickname has been lost to time. 7 Boyd’s Chester County Directory for 1888 and 1889. Their father, Henry Amole, lived nearby. 8 West Chester Daily Local News, October 15, 1891. 9 West Chester Daily Local News, April 13, 1892. 10 See West Chester Daily Local News, September 19, 1892. 11 A photo of the 1893 Coatesville YMCA team includes Doc Amole, P., standing in the back row. 12 The 1896 roster for Wilmington included Morris F. Amole. See the Jersey Journal(Jersey City) and the Washington Evening Star, February 29, 1896, and Sporting Life, March 7, 1896. 14 The event is recalled in “Dynamite Breaks Up Baseball Game,” Duluth (Minnesota) News-Tribune, July 25, 1909. Other sources identify Honus Wagner as the Paterson batter. See e.g., Arthur D. Hittner, Honus Wagner: The Life of Baseball’s “Flying Dutchman” (Jefferson, North Carolina: McFarland, 2003), 336. Interestingly, the aborted contest was one of the minor leagues’ earliest ventures into nighttime baseball. 15 As reported in the Baltimore Sun, September 16, 1896, Covington (Kentucky) Post, and Cleveland Plain Dealer, September 18, 1896, and elsewhere. 16 Washington Evening Star, October 12, 1897. 17 Washington Evening Star, December 10, 1897. 18 Sporting Life, May 28, 1898. 19 Washington Evening Star, June 13, 1898. 20 As reported in Sporting Life, June 23, 1898, and elsewhere. 21 As per the Cleveland Plain Dealer and Wilkes-Barre (Pennsylvania) Times-Leader, October 3, 1898. 22 As reprinted in the “Passed Balls” column of the Philadelphia Inquirer, April 18, 1899. 23 As reported in the Minneapolis Journal and Sporting Life, July 11, 1899. 24 For an August 17, 1899, game against Ashtabula, “Amole, late of Baltimore and Buffalo, was in the box for Erie,” Cleveland Leader, August 18, 1899. Erie lost, 6-1. 25 On September 9, 1899, Amole went the distance for Buffalo in an 11-inning 5-2 loss to the Kansas City Blues. Box score published in Sporting Life, October 7, 1899. 26 As per season-ending statistics for the Western League published in Sporting Life, October 21, 1899. 27 According to Sporting Life, March 22, 1900, and the Minneapolis Journal, April 2, 1900. 28 Decades later, Bob Feller’s 1940 Opening Day no-hitter generated passing notice of the precedent set by Amole. For a more detailed account of the Amole gem, complete with box score, see “A Basket of Fresh Goose Eggs,” by Jeff Samoray in Inventing Baseball: The 100 Greatest Games of the 19th Century, Bill Felber, ed. (Phoenix: SABR, 2013), 272-274. 29 “Gossip of the American League,” Rocky Mountain News (Denver), May 13, 1900, and elsewhere. 31 As per Baseball-Reference.com. Contemporary sources put the Amole record at 21-18. See e.g., Cleveland Leader and Rocky Mountain News, February 15, 1901. 32 Cleveland Leader, October 3, 1900. 33 Worcester Daily Spy, July 20, 1901. 34 As reported in the Cleveland Plain Dealer, August 19, 1901, Boston Herald, August 21, 1901, and elsewhere. 35 As per the Wikipedia profile of Doc Amole. Baseball-Reference provides only the Amole batting stats for the 1901 season. 36 Cleveland Plain Dealer, December 28, 1901, and Sporting Life, January 5, 1902. 37 Pawtucket (Rhode Island) Times, July 22, 1902. 38 Worcester Daily Spy, July 17, 1902. 39 Cleveland Plain Dealer, February 22, 1903. 40 Sporting Life, March 20, 1903. 41 Worcester Daily Spy, July 15, 1903. 42 Boston Herald, January 11, 1904. 43 The Amole signing with New Bedford was noted in the Pawtucket Times, August 18, 1904. 44 Amole’s debut with the Plattsburgh club was covered in the Montpelier (Vermont) Argus & Patriot, August 15, 1905. See also, the Boston Herald, August 13, 1905. 45 As per official Tri-State League stats published in the Harrisburg (Pennsylvania) Patriot, October 20, 1906. 46 Amole’s return to the Chester County League was noted in the Philadelphia Inquirer, June 24, 1906. 47 As recorded in the Buffalo City Directory for 1909 and 1910. At the time, separated, divorced, or abandoned women would often identify themselves as a widow to census takers. Tellingly, the 1029 Michigan Street address given by “widow” Magdalena Amole was the same address listed for Morris F. Amole in the 1905 and 1906 Buffalo Directories. The disposition of Amole’s earlier union with Mary Ellis is unknown. 48 See e.g., Wilkes-Barre Times-Leader and Washington Evening Star, March 24, 1909, and Cleveland Plain Dealer, March 28, 1909. 49 According to the Amole obituary published in the West Chester Daily Local News, March 11, 1912. 50 See e.g., Kansas City Star, January 24, 1912, Philadelphia Inquirer, January 25, 1912, and Boise Statesman, January 29, 1912. 51 See Delaware Death Records, 1811-1933, viewable on-line via Ancestry.com. 52 See e.g., Springfield (Massachusetts) Daily News, March 9, 1912; Philadelphia Inquirer, March 10, 1912; Watertown (New York) Daily Times, March 11, 1912; and Sporting Life, March 16, 1912, which erroneously reported a March 7 date of death for Amole, as well.